Block senders and unwanted Emails from Gmail account by these provided steps !! Gmail users can anytime block senders from their Gmail account and can even block unwanted emails that they receive every now and then. For this the users just have to process these steps that are mentioned below. The unwanted emails that the users get are of no use and its better to delete it. But many a times there are plenty of messages that the users receive from any single sender that are unwanted and the best solution for this is to block the sender. Hence, for this the users just need to undertake the below provided steps. First of all the users are required to sign in to their Gmail account. The users need to enter their username and the password for signing in to their account. The users then are needed to select on an email from that sender which the users want to block from their account. For this the users need to look for the sender’s name in their account and select on it. Users are then supposed to select on the arrow that is displayed beside the sender’s name. Further, select on the block option on the sender’s name from the drop down list. Lastly, select on the block option so as to confirm the changes. Therefore, these steps will easily enable the users to block Unwanted Emails in Gmail account as well to block senders in it. These steps should be followed correctly so that the users can process the blocking procedure with no errors. 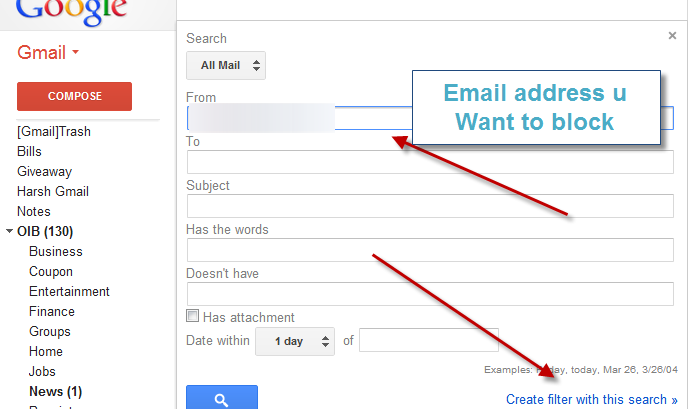 How To Set Up A Business Email With Gmail?